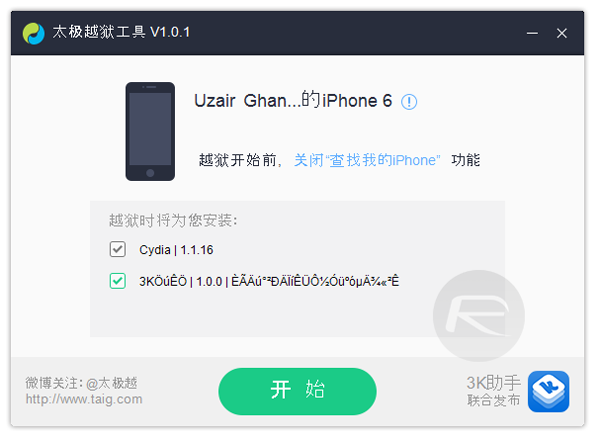 TaiG iOS 8.1.1 jailbreak is out already. 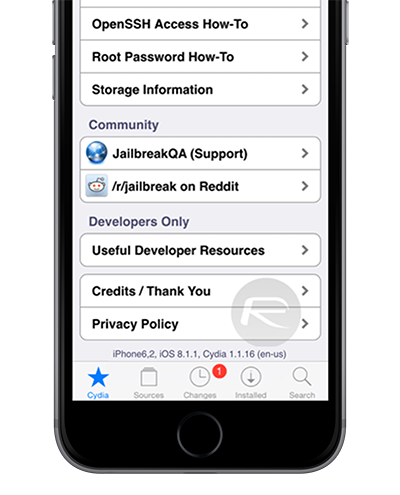 Here in this tutorial we will help you jailbreak iOS 8.1.1 untethered on your iPhone, iPad or iPod touch. As mentioned in our initial coverage, this jailbreak tool is compatible with all devices and iOS 8.0-8.1.1 firmwares, including the latest iOS 8.2 beta. Turn off any lock screen passcode or Touch ID. You can do this by navigating to: Settings > General > Touch ID & Passcode > turn off Simple Passcode. Turn off Find My iPhone by navigating to: Settings > iCloud > Find my iPhone. Restore to iOS 8.1.1 via iTunes. OTA updates usually don’t work well with jailbreaks. You can download iOS 8.1.1 from here. Backup your device using iCloud or iTunes. Step 1: Download TaiG jailbreak for Windows from here. Step 2: Connect your iOS device via USB, and run TaiG. Step 3: Uncheck the second option below Cydia to prevent installing TaiG app store. Step 4: Now click on the big green button in the center to start Jailbreak. Step 5: TaiG will now jailbreak your iOS device. Do not disconnect your iPhone, iPad or iPod touch during the jailbreak process. Once the jailbreak process is complete, your iOS device will reboot and you will have Cydia installed on the home screen. It’s that simple! Yes apple tv jailbreak for ios 8.1.1.. Software 7.0.2.. When will you work on it guys?? Mine gets stuck at 60% then stops. Help! I’m hesitating whether jailbreaking my iPhone 6 using TaiG 1.1.0 or not. Can anyone with a jailbroken iPhone 6 advise me? why wont it reconizemy device???? I just did it it worked perfect on my ios 8.1.1…DO NOT UPDATE IT TO 8.12!! This is amazing, though for me I had to download a newer version… THANK YOU!!!!! I did everything but I can’t click on the start button Please help. It won’t even let me do anything. Anytime I hit the green button, it just takes me to Taig’s website. i downloaded it and after cydia was loading screen went black and my phone was blank help! i have the same problem help! I got the same problem. This software is a virus and we voluntarily put it on our phone. its not letting me turn off my find my iphone , my cloud isnt connecting either. help! i think i fixed it but do not use this jailbreak! wont let my iPad Air connect to iTunes or iFunbox, like it has been blocked or whatever. Just comes up as a light gray ipad icon instead. iphone 4s ios 8.1.1 jailbreak safe ?? The only way that I know to fix it is to restore it, which I’m doing right now… 🙁 If you backed up your iPhone though, you should (at least) be able to get your apps back. Does it work on iPhone 6 8.1.1? Will it work with iPod Touch 5th Gen? It’s on Ios 6 do I have to update it to 8.1.2 OTA or by the use of itunes? Does it really work? You’re doing God’s work son. Thank you. It keeps saying i need to install itunes on my computer, But i already have it i even and just updated to the newer version, can anyone help? Just use an ios 6 jailbreak. but you should understand what you’re doing before you do it. Jailbreaks can wreck your device if you don’t do it properly. Do some googlesearch on the pros and cons of jailbreaking before you do. 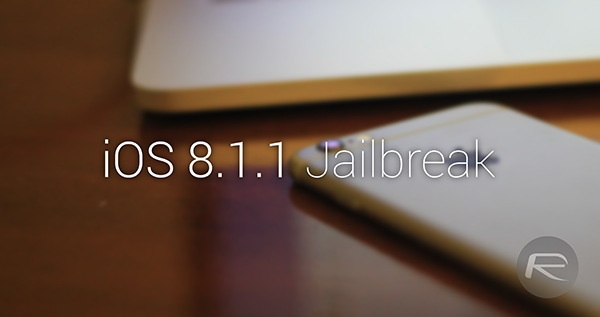 Find out what jailbreaking does, what are the consequences, etc. This is advice so that you can cope with any problems that come up and so you know what you’re doing. Tells me my Apple Driver is outdated and I should update it and check to see if there are any Windows updates. Everything is up to date, but doesn’t work. I have tried reinstalling both TaiG and iTunes several times over, but nothing seems to work. Any tips or reasons why this may be happening? Im clicking on the big green button, but its just sending me to an internet link. What am i doing wrong? Anybody still doesnt know how to ՍΝᏞΟᏟΚing AT&T devices PERMANENTLY??? There is a good site for it. Go look up just google atttiphoneuunlocking, 6 days is all we need to սոⅼοсking any phones!